Argentinean Terminal Puerto Rosario (TPR) has revolutionized the world of grain loading and storage after becoming the first terminal in the world to utilize containerized bulk handling (CBH) to export grain. TPR loads, transports and stores its grain product in specially designed food grade containers. Once delivered to the marine terminal, the commodities in the containers are stored at the port awaiting vessel shipment; replacing the need for expensive silos. Once the vessel arrives, the containers of grain are handled like normal containers until they are tipped into the hatch of a ship using a revolver. One of the most important exports of Argentina is grain. Prior to the use of CBH,TPR’s system included the use of dump trucks and shiploaders in operations similar to many other terminals. The innovative management at TPR quickly determined that they needed to find a method to improve productivity and accommodate the growing business of exporting grain. In addition, they wanted to simplify the operation with minimal investment by using much of TPR’s current equipment and infrastructure. Large capital expenditure and set-up time for new warehousing and equipment was not a viable option. While researching a number of best possible solutions,TPR discovered the CBH system. CBH is a complete system that includes the containerization of bulk products such as grain, at the inland depots or farms, before moving it directly to the port’s yard. The loading process is completed by using a specialized rotating spreader, the revolver, manufactured by RAM Spreaders, and the purpose-built containers have been manufactured specifically for handling food grade products. At TPR, the CBH system involves loading agri-bulk at a storage location or from a barge into specialized TEU containers with a payload capacity of around 30 tonnes. The sealed containers are then transported to the terminal yard and stored ready for loading. Once a vessel is alongside, the containers are handled as they would be in conventional container operations and are delivered to the quay side by truck. Loading is performed by on-board ship cranes or by mobile harbour cranes fitted with a revolver. A lid is lifted off automatically and material is poured into the hatch during a 360° rotation. To comply with environmental protection policies, high costs are encountered and the loading process becomes slow. 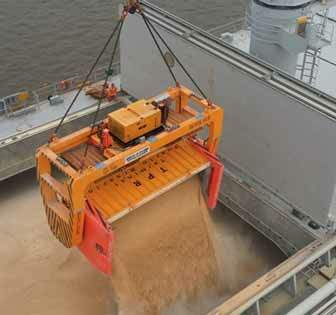 With the CBH process, loading rates can be as high as 25 cycles per hour with 27 tonnes of grain in a box. With two cranes, over 1,000 tonnes can be loaded per hour. The RAM development team is now working on a system to load at twice this rate. To acquire and set up a traditional bulk grain operation can take years. In contrast, a CBH operation can take no more than six months, allowing for a much faster and efficient way to get bulk commodities into the market. Putting in conveyors and bulk storage makes the system dedicated, however, this is not the case at TPR, as they can load conventional containers on Monday, grain on Tuesday with the revolver, and back to containers on Wednesday with no clean-up required. An additional benefit of the CBH system is mobility.The CBH system, which includes the RAM revolver and containers, can be moved to another terminal if required. The investment is transferrable. The use of container terminals gives grain exporters and traders another route to market. Often during peak harvest time, the bulk loaders get congested and their customers cannot export the product when and how they want. By using the flexible CBH system it is now possible to get the grain to market.What started as a small change in Argentina is set to grow into a revolution in grain loading globally, with a new flexible low capital solution to export agri-bulk. The CBH system is already in full operation in Chile,Australia and Africa in the mining industry for products such as copper, coal and iron concentrates where throughputs well over 1,000tph per crane are achieved. The RAM revolver can be designed to operate with any type of port equipment such as reach stackers, ship to shore cranes, mobile cranes and ship’s gear cranes. RAM Spreaders has been manufacturing spreaders since 1972. Now as part of the PEINER SMAG Group, the company is a major lifting accessories supplier and boasts a strong reputation within both bulk and container handling industries. RAM Spreaders’ corporate headquarters, with design and development facilities, are in Singapore, with a manufacturing plant in China and servicing facilities in Lancashire, England and Salzgitter, Germany. Recent developments include the new SingFlex TwinForty Headblock for single hoist ship-to-shore cranes. All-electric separating twinlift telescopic spreader and a telescopic spreader designed for mobile harbour cranes. These new innovative products join the existing RAM range of telescopic, fixed and separating twinlift spreaders, offering the finest choice for ship- to-shore cranes, RTGs/RMGs, mobile harbour cranes and mobile equipment.